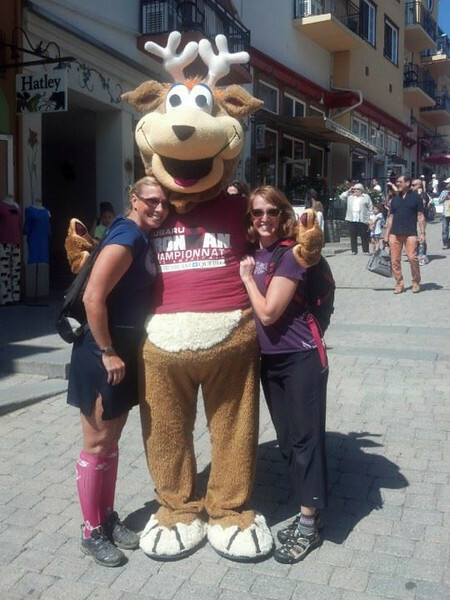 Even the locals are wicked friendly! 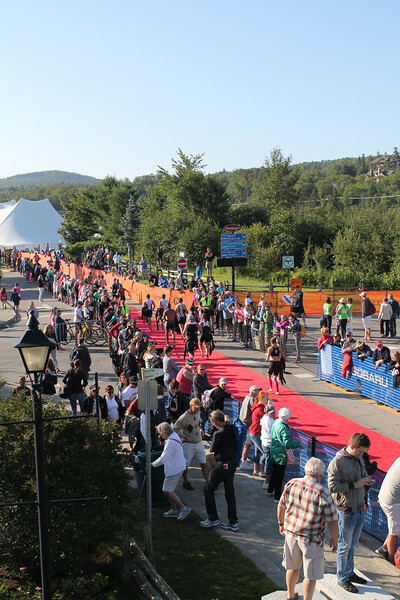 The 2014 edition of Ironman® Mont Tremblant, the third year of the race, will be the first time that Team Endurance Nation has made this a Key Race. We have had more than 20 athletes complete the full distance each year, as well as the half-distance. After all the good feedback on the venue, town and course, we simply had to target the race…and present this collection of resources and information. Racing Mont Tremblant? Attend Our FREE, LIVE Four Keys Talk! In preparation for this year’s race, we held our first ever Mont Tremblant Training Camp, an epic weekend with 2 x 112-mile bike rides plus a long run. In addition to this year’s camp, TeamEN has historically had between 20 and 25 athletes at the race every year. We’d like to share that experience with you with these consolidated tips and resources specific to the Mont Tremblant course. Mont Tremblant’s brief race day history has been very generous. The temperatures are generally in the mid-70s with a slight chance of rain. Seriously vanilla. That said, don’t sweat the weather report until about Friday of race week. Again, we’ve seen the weather change dramatically in the last fews days before the race and the forecast for Sunday won’t be accurate until Saturday morning. The timing of an event should be the #1 criteria you use for selecting what Ironman to train for and race — not hills, not weather, not water temperature, but does rather the timing of the event work for you. Will you have cooperative weather and hours of daylight available for training, especially in the last 8-10wks of your work up? Do not underestimate the challenges of long, long rides on the trainer necessitated by choosing a sub-optimal combination of race date and your typical local weather conditions in your final workup. 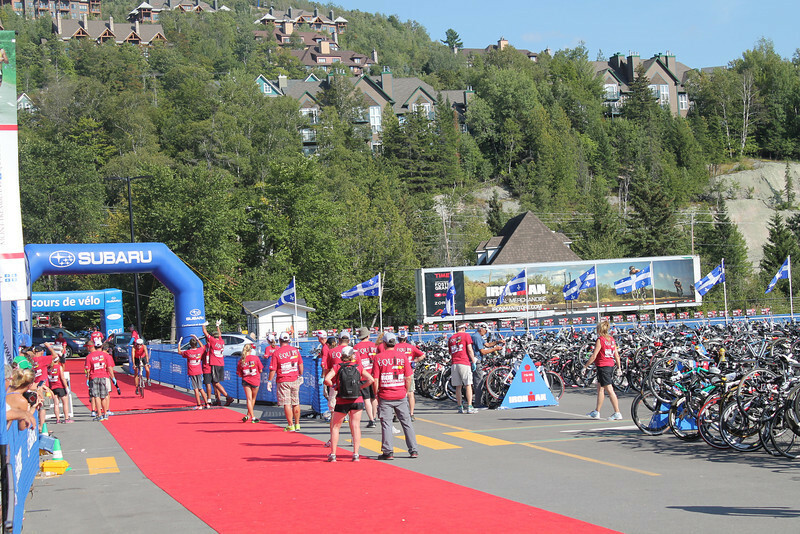 The combination of the variable weather and the mid-August date of the race means that you need to have time to acclimate to the heat, in the event Tremblant serves up a hot day. Thankfully, the weather and daylight savings intersect before early May, when your training begins to ramp up. Southeast: Timing of the race is good, with regards to hours of daylight, the ability to train outside, and to acclimatize to the potential heat of the race. Northeast: Timing is…just right. This is really the sweet spot for long-course racing, plus it’s relatively close for most triathletes in the region. Northwest: Training outside = fair; acclimatize = not so good; logistics and travel costs = cost prohibitive. Southwest and West: No issues with hours of daylight, weather, and the ability to train outdoors…in fact it might be a bit late for most Left Coast people. More than anything else, the sheer distance of the race makes it rank a bit lower. Bonus Note: The timeline from Tremblant to Kona is relatively tight, should you be targeting this event as a qualification opportunity. You’ll have roughly six weeks to make the transition. Travel costs and logistics: Tremblant is long drive from almost anywhere in the US. Even our Canadian friends have a solid drive unless they are from Montreal. You can fly, but a taxi would be $300 trip unless you have a hotel shutter. Lodging: ALL hotels in the area are booked (Tremblant is small) and rates are high — it’s a resort town on a busy weekend! You might be able to book a more affordable hotel either in old Tremblant or nearby and then drive each way to the race. Parking: Tremblant has tons of parking; you might just have a short walk (or shuttle ride) if you aren’t saying in the immediate resort area. Not an issue. Dining: Lots of options to suit just about anyone with their specific culinary preferences. Remember French is the lingua franca, so if you have specific dietary needs you might want to know the translation for “nut allergy” or “gluten free” before you arrive. Be sure to sample the local delicacy – poutine! Now, let’s get on with the race! Practice Swims: The course has buoys out there to swim for most of the year, but due to boat traffic the proper course won’t be fully setup until sometime Friday. You’ll be able to swim in the lake before race day, just don’t over do it! We recommend you swim briefly around your race start time to note the position of the sun. Start easy, then finish strong as you identify landmarks for the final return trip. It’s more important that you get a feel for the water conditions than do any hard work. Bonus Note: The practice swims start and end at the swim start area, essentially hugging the small peninsula you see in the image below. You won’t really have a chance to completely swim the exit area. 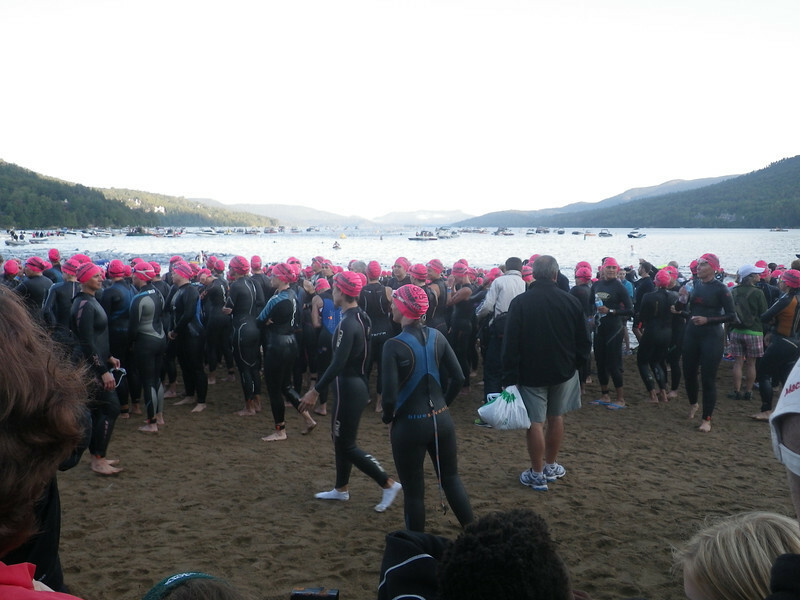 The Swim Start: The inaugural Mont Tremblant swim start, on the beach, was instantly proclaimed “too crowded” by almost everyone who raced. With nearly 3000 athletes all jammed into a narrow beach there was a LOT of contact. As a result, in 2013 it was one of the first “swim smart” events, with a transition to a wave start. This will continue in 2014, with six waves after separate Pro Men and Pro Women starts. Based on this change, swim times seem relatively consistent with other events. You Swim Right Out Between Those Boats! 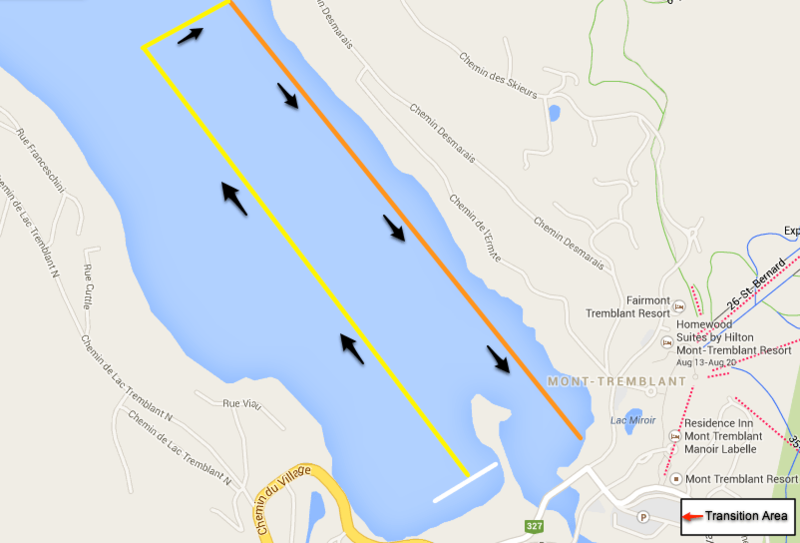 The Course: The Mont Tremblant swim is a one-loop affair in Lake Tremblant, from a beach start. You’ll swim directly out from shore about 1800m, turn right and swim about 200m, turn right again and swim the remainder back towards the separate swim exit area. The Temps: The water temperature is pretty consistent in the upper 60s / low 70s. We recommend a full wetsuit. Some athletes opt to wear long john wetsuits, but it’s really your personal preference. 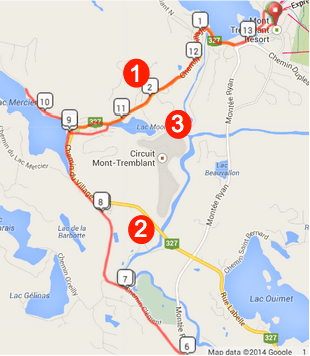 Mont Tremblant has one of the longer transitions you’ll face, but the layout and design make it pretty quick. It’s basically a long run from the lake, up a street and into an extended area of tents that house your bags and the changing area. Your bike is racked in a similar area, with plenty of volunteers to help you out. By the time you exit transition at the mount line, you will have covered more than a 1/2 a mile! Area 1: Montee Ryan Out to 117 This is your first chance to blow the entire race. IGNORE the hammerheads and others racing, be safe and just get out to 117. The hills are steeper on the way out, and as a result will take more work than you should be ready to give. Same drill when you come back into town and start lap number two, but you’ll be much more tired. Area 2: 117 Out/Back + St. Jovite: If you reference the bike course profile, you’ll see the rolling to flat section that is 117, book-ended by two climbs (same climb just either side). On the way out, you have a 3-mile effort at roughly 3% to 4%. On the return trip, this climb is just 1.5-miles long, but more like 5% to 6%. In between this climb you have a flat to rolling section for approximately 24 miles. This is a great place to get super aero and fly. The first lap is generally free, but by lap two the wind here can be quick strong significant and can really slow you down you have over-exerted early on. Just sit down, relax, and get into a really nice groove. In our opinion, this 24-mile section, which you’ll do two times for a total of 48 miles, is essentially free. Just ride steady, ride your race, and ignore the other athletes around you. The town of St. Jovite is just a quick jaunt with nothing to speak off save for some fans (! )…just shoot in, flip it, and shoot out. Area 3: Montee Ryan In (From 117) After your “free” early miles you’ll turn right on Montee Ryan when you start to work your way back towards the resort of Mont Tremblant. You still have to climb, but these hills are steady with fast descents. Manage this section properly and you’ll be able to carry your momentum halfway up the next climb. You’ll hit the rotary just outside the resort with the DJ / party…and then it’s off to do the serious work. 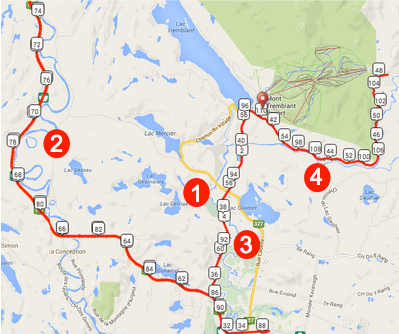 Area 4: Out / Back to Lac Superior After a short hill — hey, not so bad! — you are slapped with the meat of this climbing section. It’s a two-mile effort with grades between 3% and 8%. After each mini-climb the road will level out but it never really drops off to give you a true chance to recover before the next climb. You’ll enjoy a break of about a mile of climbing with grades up to 4% before you hit the double-whammy steep climb just shy of the turnaround. Think 6% to 8% into a 10% to 12% section with a kick up to 15%. Easily 95% of the field will have to stand here to not fall over. Once over that hill you have a brief chance to recover before one more small hill and the turn around. Then it’s flip it and bombs away down the entire section. As slowly as you will have to climb this area, a good descent will help you regain a ton of time. Just be careful as the road is narrow here and can be dangerous. As you head back towards the resort, you’ll pass the Bike Special Needs area and enjoy some really great support from the crowds. T2 is Just as Awesome as T1 — Who Doesn’t Feel Like a PRO in this Venue? The run course is very similar to the bike – there are places to go fast and places to suffer. Places to have fans and places to be very…much…alone. It’s a fair course with adequate ups, downs and flats such that most people can still run well if they aren’t nuked. Two Loops of the Above; Plenty of Hills and Flats for Everyone! Several steep uphills in the first 2.5 miles. Lots of spectator mojo in the first two miles and many, many athletes run much too fast here. Don’t be one of them! This section eventually turns downhill into Old Tremblant. Area 2: Out / Back on Rail Trail Once you jump on to the rail trail, you are running some flavor of flat to slightly down all the way to the turn around. Once you flip it you have, surprise, flavors of flat to slightly up back into Old Tremblant. You’ll run past the converted rail station for a quick one-mile out and back section on packed earth (nice!). Bonus Note: For the later finishers, this bike path can get quite dark and lonely…be mentally ready for the challenge that is six miles in mostly dark woods with minimal spectators! Area 3: Old Tremblant Back to the Resort / Turnaround / FinishArea Once again you have to climb back into the resort, but like the bike these hills are steadier and less steep than when running them outbound. Enjoy the descent sections and watch your heart rate. Just put your head down in the last mile. You have two tough climbs, the first you saw on the way out but the second is a new one that comes at miles 13 and 26 as you navigate into the heart of the downtown section to either start Lap Two or hit The Finish. Just. Keep. Moving. Awesome! You’ll stay right to head to the finish, enter the proper downtown area and fly downhill towards the stands and the finish line. Enjoy and don’t forget to live it up in the chute. The finish line in Mont Tremblant is quite spectacular; do your best to get out here and really soak it up all the way to midnight! Racing Mont Tremblant? Attend Our FREE, LIVE Four Keys Talks! IRONMAN®  is a registered trademark of World Triathlon Corporation, is not affiliated with Endurance Nation®, and does not endorse or sponsor our products, materials or events.